Old steamer trunks kept undisturbed in local attics are always exciting objects. 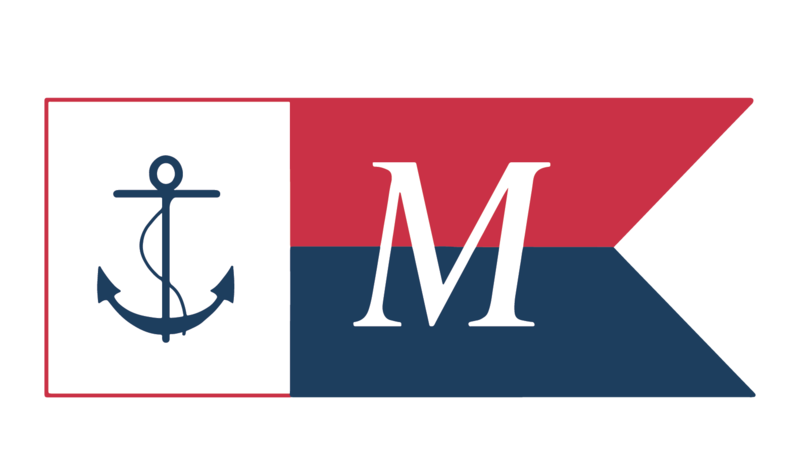 Maine Maritime Museum's collection of such artifacts is a direct reflection of the vibrant shipbuilding community that was (and still is) Bath, and the multi-generational families that still reside here. 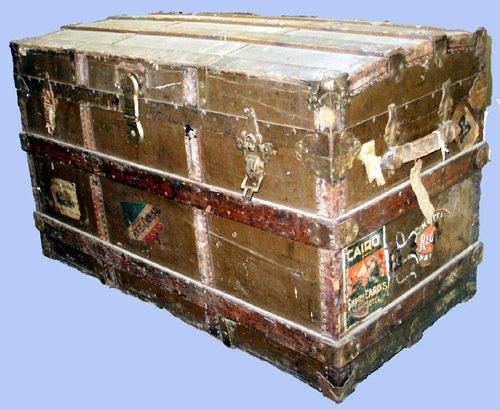 The Mary Dennett trunk, with its numerous hotel labels from far parts of the world, is a quintessential example. 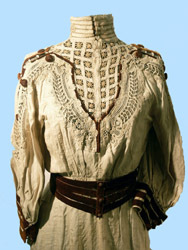 But its real glory is the astonishing collection of clothing that was stored inside it: over ninety garments of pre-WWI vintage, a complete wardrobe that ranges from petticoats to overcoats, shoes to shawls, and everything in between. Who was Mary Dennett? Municipal records and obituaries yield that she moved to Bath from Minneapolis as an infant with her parents Hugh and Bridget Cannane shortly after her birth in 1862. In August of 1890, she married Bath sail maker Charles C. Dennett, who opened his own sail loft the following year. They resided at 850 Washington St. While visiting his sister Clara in Boston in 1903, Charles unfortunately contracted typhoid fever, and died there after a two month illness. He was only 42. Mary became a young widow at 41. By 1919 Mary was remarried, to longtime Bath barber Charles H. Eugley, and assumed his address at 9 Linden St., facing the Patten Free Library in the city park. She was 57, he was 64. After almost a half century of cutting Bath residents' hair, Charles died in 1928, and Mary was widowed again at age 66. She lived on at Linden St. until 1939, when she succumbed after a five month struggle in Portland General Hospital, to, as the cemetery record bleakly reports, "starvation due to a spontaneous fracture of the face from carcinoma of the mouth." It is to the years of Mary's first widowhood, between 1903 and 1919 that the contents of the steamer trunk belong, and they speak of a lively time. The many labels affixed to the outside of her trunk trace a Grand Tour of Europe and beyond: the Allan Line S.S. Tunisian from Montreal; Isle of Wight Railway to Waterloo [Station, London]; Hotel Regina, Paris; Grand Hotel de Quirinale, Rome; Shepheard's Hotel, Cairo. Some of these high-style palaces are still in business today. Other labels indicate her rail passage through Nice and Naples. Two now historic California hotels are also in evidence -- the Hotel Rafael, San Rafael and the Glenwood Mission Inn, Riverside, near San Francisco -- hinting at another possible jaunt West. 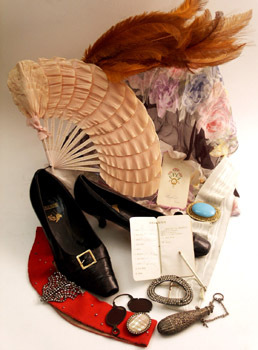 A small box of assorted accessories affords a few more hints of Mary's doings abroad: souvenir fans from several London restaurants, among them a renowned fin-de-siecle landmark, the Trocadero in Picadilly. It defies logic that Mary Dennett would not have viewed the Sphinx through the tinted pince-nez, though the perfume flask and other finery were perhaps more appropriately employed back at Shepheard's palm court and grill room. The merry widow's dance card from the Alexandria hotel is almost full, a different gent for waltz and two-step. 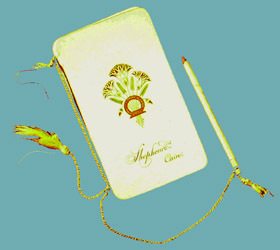 Serendipitously for us, she penciled the date on the back: "January 28, 1908," and a long way, indeed, from the banks of the Kennebec in Bath, Maine. How did this sail maker's wife pay for her Continental progress? Was there a life insurance policy on her husband Charles? Did she sell his business after his early death? Our historical myopic voyeurism must leave Mary Dennett dancing under the desert stars, and us with always more questions.